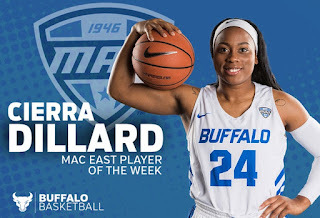 BUFFALO, N.Y. -- After a strong week on the court for the University at Buffalo women's basketball team (2-1, 0-0 MAC), senior guard Cierra Dillard has been selected as the Mid-American Conference East division Player of the Week, as announced by the conference office on Tuesday. 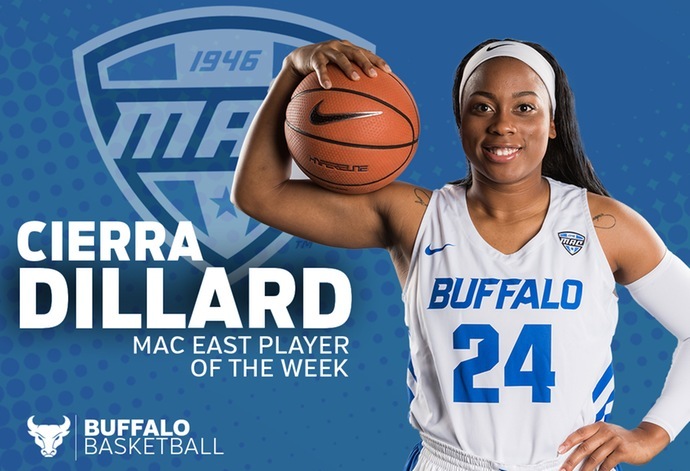 This marks the first time this season and the fourth time in her UB career that Dillard has been awarded the weekly honor. Dillard finished off her impressive week for the Bulls averaging 28.5 points, 5.0 rebounds, 4.0 assists and 2.5 steals across a pair of games while also shooting 46.3% from the floor and 87.5% from the charity stripe. The Rochester native posted 25 points, six rebounds, four steals and three assists in the Bulls 88-61 victory over Niagara on Wednesday night. The senior backed that performance up with her best of the season against #3 Oregon on Sunday. The lethal scorer showed off for the Ducks faithful as she went off for a season-high 32 points, five assists and four rebounds in the 102-82 loss. Dillard finished off her third career 30+ point game going 10-for-24 from the floor while playing all 40 minutes. The team captain has now posted three straight 20+ point efforts to begin the season and seven straight dating back to last season. She is averaging 27.6 points, 5.0 assists, 4.6 rebounds and 3.0 steals across her last seven games for the Bulls. On the year, Dillard ranks sixth in the NCAA in scoring this season as she is averaging a team-best 26.7 points, 4.7 rebounds, 4.0 assists and 2.5 steals across an average of 37.3 minutes/game. The Bulls will return to the court this weekend as they head to Sin City to participate in the South Point Thanksgiving Shootout in Las Vegas. UB opens the tournament on Friday, November 23 at 8:00 pm against Georgetown before closing out their trip with a 8:00 pm showdown against South Dakota State on Saturday, November 24.